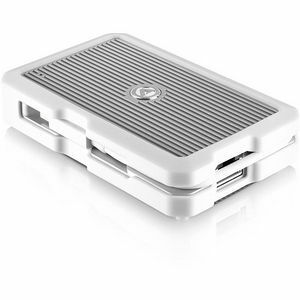 The AKiTiO Network Adapter offers a portable, bus powered, fanless and low-cost 10GbE solution enabling 10GBase-T connectivity for Apple® OS X® and Microsoft® Windows® environments and features the latest Thunderbolt™ revolutionary I/O technology from Intel®, with transfer speeds of up to 20Gbps. The AKiTiO Thunderbolt 2 adapter is ideal for notebooks, such as the Apple® MacBook Pro, MacBook AIR and professional workstations that require reliable, accelerated access to external storage and networks for I/O demanding applications. The 10G network adapter utilizes a simplified design for high speed, 10GbE networking for modern workstations and ultrabooks which typically lack 1GbE connectivity or the capability to deploy an internal PCIe 10GbE network card (NIC), but may be equipped with a Thunderbolt™ connector capable of delivering up to 20Gbps. The AKiTiO Thunder2 10G Network Adapter provides an extremely portable 10 Gigabit Ethernet solution. This sleek and compact adapter runs on bus power alone. The rugged aluminum housing with its unique heatsink design and open gaps for air flow can dissipate the heat and keep the device cool all without any noise whatsoever. Hassle-free with its captive Thunderbolt cable, simply plug in the device, install the driver and you are set to go.